Fifteen years ago, I was a happy, average and somewhat ordinary work-from-home Bakersfield mom. I was working as a life coach, specializing in working with writers and creatives. I also had a weekly radio show, so, when I went on a tour of a local performing arts academy to sign my children up for classes, I somehow found myself choosing to take a “teens and adult voice” class. I was the only adult in the first session. I just wanted to make sure my “instrument” was the best it could possibly be. When the voice class ended, I attempted to put another class together but instead was invited to take an acting class. “No thank you!” I said. I was rather adamant about it. Naturally, life surprised me. I decided to take the class. Since then, I’ve done more than 30 plays, several films by local production companies, a few music videos and a handful of commercials. For a town of its size, Bakersfield has a vibrant and thriving theater community. On any given weekend, locals can find a wide variety of productions with talent rivaling larger stages across the country. Many theaters provide a welcoming environment, inviting new people to participate in a variety of ways. Bakersfield Community Theater is proudly known as the longest continually running community theater in Bakersfield. It is off the beaten path on South Chester Avenue. Its large stage and friendly prices make it a great place to visit, and it has the only free children’s theater program in town. Bakersfield Music Theater/Stars has extensive offerings, including Theatre Restaurant, Stars Playhouse (Stars West), Stars School of Performing Arts and the Stars Cafe. It has been providing quality theater and theater education since 1969. BMT also produces Broadway-style musicals at Harvey Auditorium. The Empty Space is located on Oak Street between California Avenue and Belle Terrace. It started 16 years ago as a completely donation-based theater and now includes an art gallery. Here you’ll find a great balance of mainstay theater classics mixed with late-night productions that are often original and edgier. Gaslight Melodrama Theater & Music Hall in the northwest brings its brand of good old-fashioned productions, often poking fun at life with stories that have a local flavor. It is also home to Omnipresent Puppet Theater productions. In addition to these established companies, Bakersfield College, Cal State Bakersfield and our local high schools are inspiring spaces to watch our town’s up-and-coming talent. For children wanting to get into theater, Acting Out Theater Production, NOR Junior Theater and Tonicism Productions are great places to start. Julie Jordan Scott is an award winning storyteller, best-selling author and stage mom who fell in love with the local theater community 15 years ago and has never looked back. She has made her home in the Alta Vista/La Cresta area in Bakersfield for almost 30 years, raising four children here. In addition, Julie is an active volunteer at North High where her youngest child will be graduating this year. The views expressed are her own. 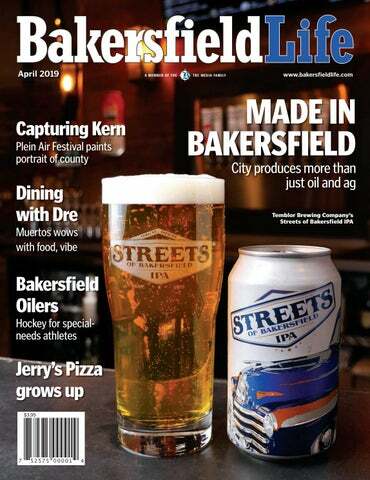 Be in Bakersfield is a grass-roots movement aimed at changing the conversation around Bakersfield and activating positive change within our community. Find more information at www.beinbakersfield.com or on Facebook and Instagram at @beinbakersfield.